Redi of Orlando provides emergency lights repair for residential and commercial facilities in Orange City, DeLand, and Sanford FL. Emergency and exit lights help residents, employees and visitors locate the nearest building exit in the event of an emergency. Most building codes require emergency and exit lights to remain illuminated at all times and have a battery backup in case of power failure. Facility owners can be fined if any exit signs are found to have a burned out bulb or are in need of repair. Our emergency light kits allow facility managers to quickly and easily repair malfunctioning building emergency lights. Our factory-trained fire safety experts can repair all types of emergency exit lights in Orange City and neighboring communities. We provide complete on-board diagnostics and testing as well as battery and bulb replacement. LED emergency light conversion kits are also available and highly recommended that can substantially reduce energy costs for your facility. 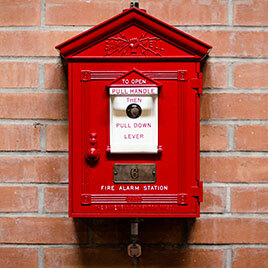 Accidents and emergencies can occur at any facility at any time. Make sure occupants can safely vacate your building in an emergency or power failure with our emergency lights repair service in Orange City, DeLand, Sanford and surrounding communities. And with the end of fiscal budgets approaching for many businesses, now is a great time to inspect and repair any faulty exit signs that may exist in your restaurant, shopping mall, office building or any other type of facility. Founded by a former fire fighter with more than 25 years of industry experience, Redi of Orlando is your fire safety expert. Our service is fast, efficient and economical. Is your building ready? To schedule emergency lights repair in Orange City, FL, contact us at (407) 474-0699 today!